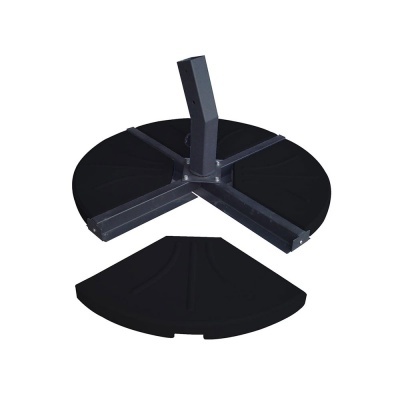 Norfolk Leisure Cantilever Parasol Base Section 20kg from the Garden Must Haves range is a granite quarter section suitable for weighting down one part of four sections of a Cantilever parasol. 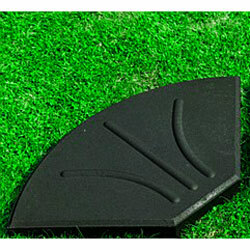 Matt Black finish rounded edge quarter section concrete base suited for a large cross base free-arm parasol. Subject to area of exposure of winds and dimension span of parasol, the number of weight sections required varies. 3 metre free-arm Parasol in an extremely windy area would require 80kg weight on the base, so four sections should be purchased. A cross base free-arm cantilever parasol allows up-to four quarter segments, each granite section weighing 20kg due to mobility.